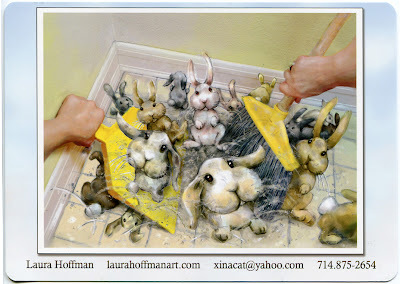 Laura Hoffman Illustration & Design: My New Postcard!! I just received my printed postcards for the upcoming summer Society of Childrens Books Writers and Illustrators (SCBWI) conference. Sometimes, I get nervous when sending artwork out for print. This time, I am pleasantly surprised - these look great! I used Overnight Prints. Dust Bunnies is part of the Idiom Series. I have plenty of these guys under my bed and in corners and do my best to capture them before they multiply. Dust Bunnies has won several awards, including a Certificate of Merit from the Society of Illustrators of Los Angeles (SILA West) and an Honorable Mention for the 2013 OC Fair Visual Arts. I will be back at the OC Fair for Judge's Night this Thursday, July 25.